As an environmental and social justice solutions strategist in Vermont, Jenn Wood ’00 is focused on energy conservation and supporting low-income communities that will be hardest hit by the impacts of climate change. Her consulting practice focuses on realistic, yet timely solutions for individuals, companies, communities, or organizations that can be easily implemented and successful. “Every little personal choice we make does matter whether it is changing a lightbulb, eating more plant-based foods, or refusing to support a business whose values are not in alignment with yours,” she said. At Northland, she crafted her own major, sustainability and education, was involved in the Sunshine Bike Shoppe, the McLean Environmental Living and Learning Center, renewable energy, the building of a straw bale house, and later lived in a sustainable community in Scotland. She completed a master’s degree at Tufts University in Boston in 2007 and moved to the aptly-named “beauty spot of Vermont,” Grand Island on Lake Champlain. For years, she ran the weatherization program for a local community action agency. “I served and still do as not only a staunch crusader for climate policy and action but also ensuring that solutions are crafted in a way that do not negatively impact the most vulnerable populations,” she said. As a result, she was one of the co-authors of the ESSEX Plan—a Vermont-specific policy guide to put a price on pollution in a way that is not regressive. Throughout the year and especially while the legislature is in session, she works with the other co-authors of the plan and associated groups to educate, engage, and bring awareness to the ways in which Vermonters need to step forward on climate initiatives. 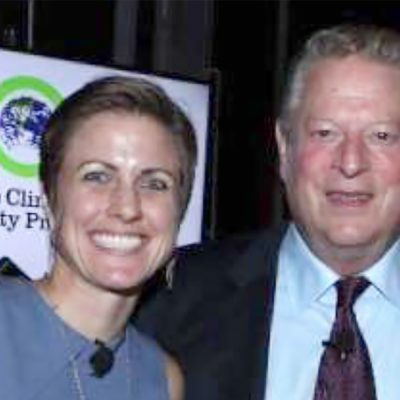 She volunteers for The Climate Reality Project, whose chairman is former Vice President Al Gore, the Climate Reality Leadership Program, of which she mentors climate leaders (116 as of August), and is the founding chair of the Vermont Chapter of Climate Reality.